Introducing the long-awaited skinny version of our popular Sereno polo belt. Now in a narrower width, the skinny Sereno belt is perfect for wearing around the waist on a dress or for wearing with your best skinny jeans or jodhpurs. The new 2.5cm size suits the smaller frame well as the belt will be in proportion and will not overpower your outfit. The Sereno style features a beautiful mix of cream and blues, which looks wonderful set onto the rich Havana brown leather, hand-cut and hand-sewn in Argentina by skilled artisans. These classic tones will co-ordinate nicely with many colour palettes and create the perfect finishing touch to any nautical ensemble with white denim and being an excellent accompaniment. This polo belt exudes the sense of sailing along the Rio de la Plata on a peaceful Sunday afternoon. You will experience for yourself the superlative quality of our luxury, handmade belts, meticulously crafted and subject to our strict quality control guidelines. 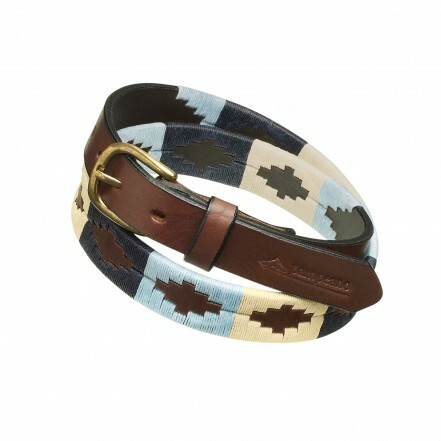 The leather of this polo belt is made from the highest A-grade vegetable tanned Argentine leather. This leather is known to please all of the senses from the sight and feel of the product to the beautiful scent. The patterns on all of our polo belts are intricately hand stitched one by one, making every single one of our products unique in its own right.